Family Size: with a charging station, everyone can charge! With more smartphones, tablets, gadgets and electronics, we are piling up a ton of devices in our house over time. This creates a shocking mess especially when we try to charge these devices. 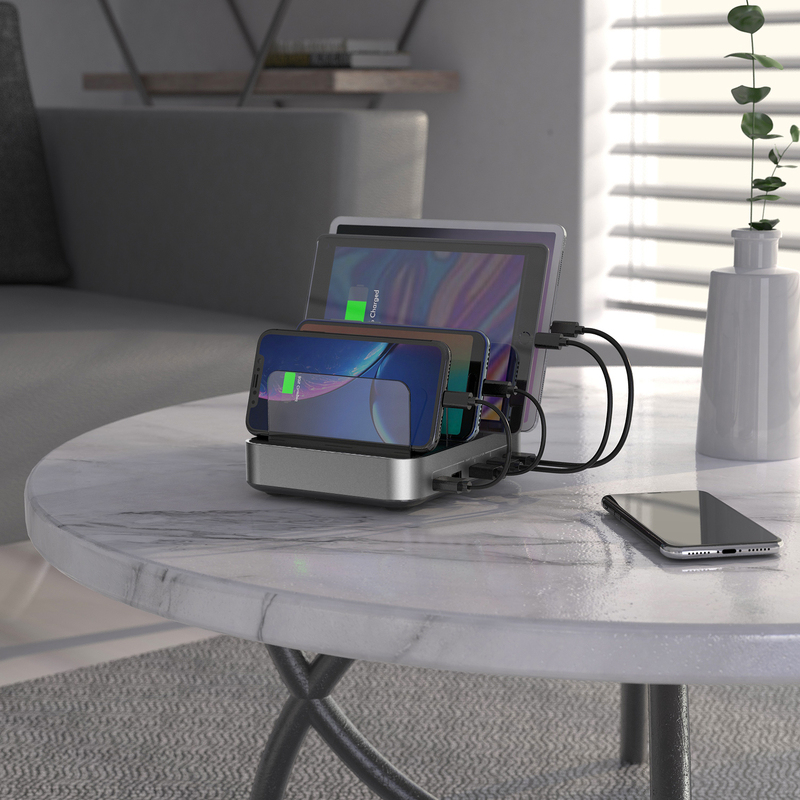 To keep our room clean and organized, inspired designers made this multi-device charging station for you to organize and charge multiple devices at the same time and manage unused devices easily. This charging station is about 9.4" x 5.5" x 1.9" in its dimension and 8" wide for each of its baffle slot. All your devices can be placed neatly in a small on the charging station's dock. A total of 50W high power output enables each charging port to deliver up to 2.4A current so you can charge five devices at full speed simultaneously. The smart chip will automatically manage optimal output for each charging device (0.1-2.4A), which is not only good for charging speed but will also help protect your device's battery and overall power safety. You can leave your device on the dock overnight, there are built-in protections for overheating, overpower and short circuit. We care for your safety, every risk factor is considered. Powerful & Reliable: This USB charging station provides 50W / 10A powerful output, which can simultaneously charge 5 tablets at full speed. Smart Charging Technology will ensure each port delivers optimal current (up to 2.4 A) for your device, makes charging fast and safe. 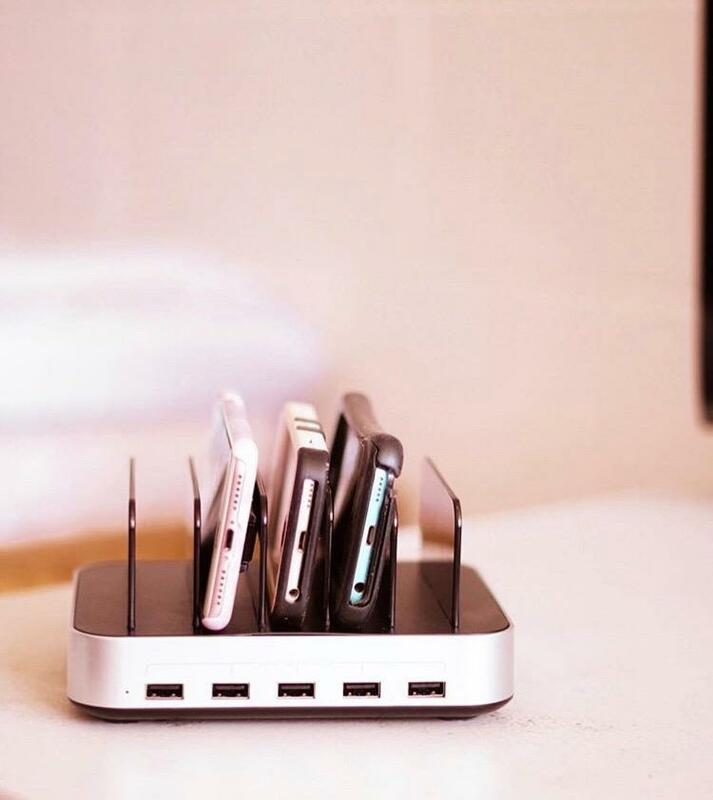 Organized table top: Besides the charging convenience, this device also has 5 sections of storage space (0.9 inches wide) to help you hold your devices being charged. Eliminate the trouble of cable mess and keep your desktop organized. Additional Perk: The short cables in the pictures are included in this package. 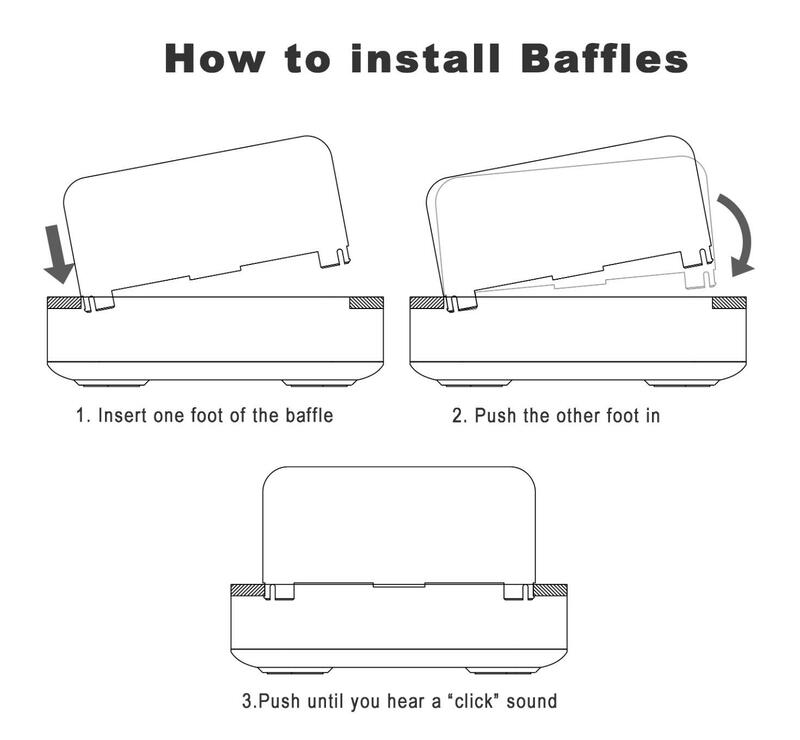 Strong Baffle & Tilt Free: Made of strengthened ABS material, these durable baffles can each holds up to 4 pounds of weight. The charging station has a stable base and antiskid pads under. Each purchase comes with 12 months warranty and friendly customer service. We always try providing better service. Any advice is welcome. This is a great charging station, and our family loves it. No need to go back and forth, they put all the devices to the station, and it has the same charging speed as the regular factory charger from the original cell phone package. I like that it has the short cords and areas to hold up your smart phone and other electronics. It really cleans up the charging area quite a bit. The only bummer is that it does not come with a cord that is compatible with iphones so I have to use a longer cord for that. Not the end of the world, but does decrease the clean look of it a bit. Really glad we bought this docking stand because its very easy to use, it's light weight, and great value for the money you spend! It's so light weight that you can move it where ever you want to and it's easy to use because the charging cords stay connected and the trays slid on and out smoothly! We charge five electronics at one time and all five charged up in no time, so it doesn't lag behind if more things are charging at one time! Love it! Just the way I expected. There are many customers asking for a charger. However we only had one charger for each android and iPhone. 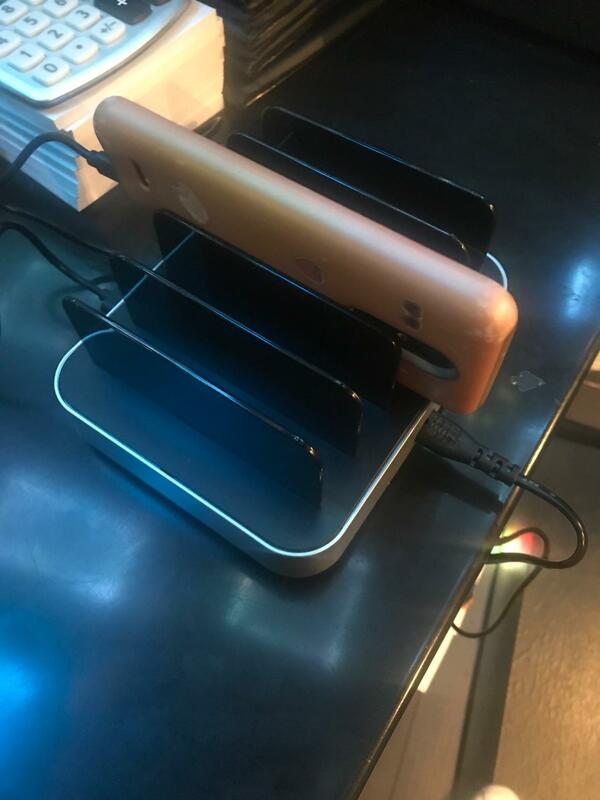 Now we can charge up to 5 different phones and use the old charging cables for employees. We've got some complains about charging phones. This product helps to solve the problem. First of all it is very useful produt for me bcuz i work in lounge many my customer want to charge their cellphone however we only have iphone cables so we can only charge few iphone. After i get this android user also can charge their cellphone whenever they want . Also the price is ok def its aforsable. Moreover it is very easy to use u can just connect all the cable that's it i def recommend this product for others who wants to buy the chargestation. This is a really great station for charging multiple devices. We have 6 phones and 4 tablets in my house, and keeping them charged has been a challenge. The kids fight over the outlets and the plugs. With this station, everybody gets to charge, and it doesn't take up the whole desk space. I plugged it into the wall and set it on the corner of the desk in my kitchen. I have all Apple Devices, and I have plenty of lightning cables, so I plugged lightning cables into all of the slots. I was able to charge a bunch of devices simultaneously, and the slots hold all of the devices. I may buy some cables that have multiple ends so that guests can charge if they have Android. As some others have mentioned, the dividers are a little tricky to get in, but once you get them in, you don't take them out, so it's not a problem. And I could see that people who don't already have a lot of cables might want the option to request certain kinds. As it is, I threw the included cables into my general cable drawer where I have a ton of mini and micro USB. I received this product free for evaluation, but was not compensated in any way for this review. Please watch the video for a more in-depth look but just know that this charge station is awsome! I bought this item for a teacher who needs to store and charge multiple iPads in her classroom. It is perfect ! Keeps the pads clean, organized and charged. Product comes with all cables needed, is well made and an excellent t value. 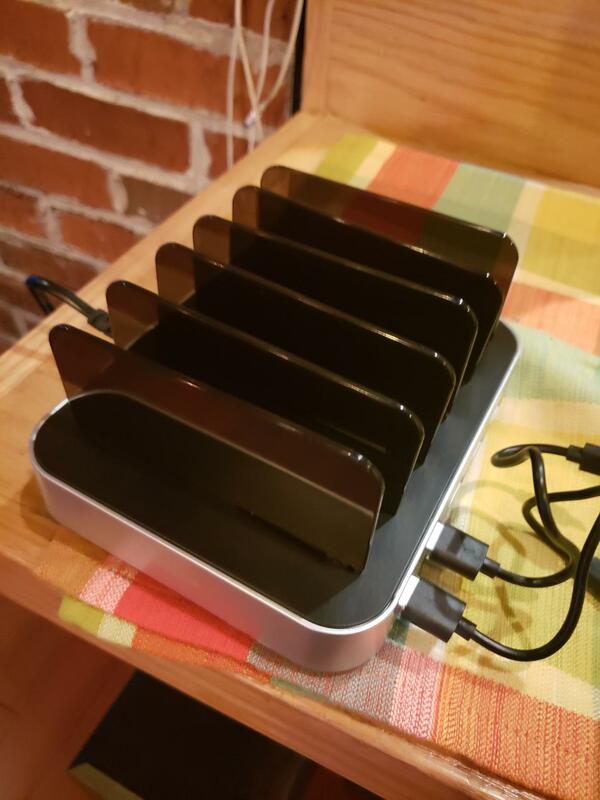 This charging station is easy to use and allows me to keep all my devices in one place to charge. I would recommend to anyone looking for a charging base solution! This Charging Station is very useful. 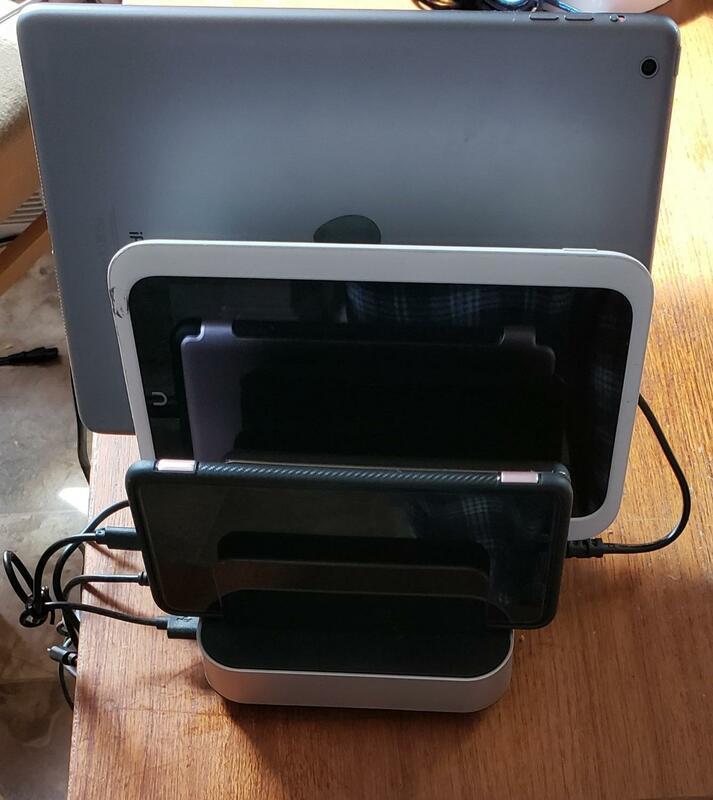 Having all my devices charging in one location had become hassle-free. all devices charged faster, at the same time! Phones, iPads, and kindle charged at the same time. I was able to use this to hold (and charge) two Fire HD7 tablets with kid proof cases, an iPad 2 in a LifeProof case and my phone. It's discreet and is a much better solution than plugging a bunch of devices into the wall and leaving them on the table/counter/etc. It comes with short micro USB and USB-C cables, which was a nice bonus. The customizable baffles is also a nice touch as my preferred setup didn't require use of all of them. Charging dock works as expected with no issues. The gray inserts were challenging to put in, but they are super sturdy and seem to stay in place very well. (Tip - insert one foot, then push the other in until click - don't try to push both in at the same time.) My one request is a different assortment of charging cords - but after speaking to seller, they plan to include 'lightning' chargers beginning April 2019. This charging station is fantastic. Not only does it quickly charge devices, but it also organizes and holds them. I am impressed with the sturdiness of the charging station. The charger didn't tip over when I charged 4 devices plus an iPad. Like others have commented, the dividers were difficult to insert. I was surprised at how much pressure I had to use. However, the dividers are solidly made and are not flimsy. Once inserted, the dividers stay put. 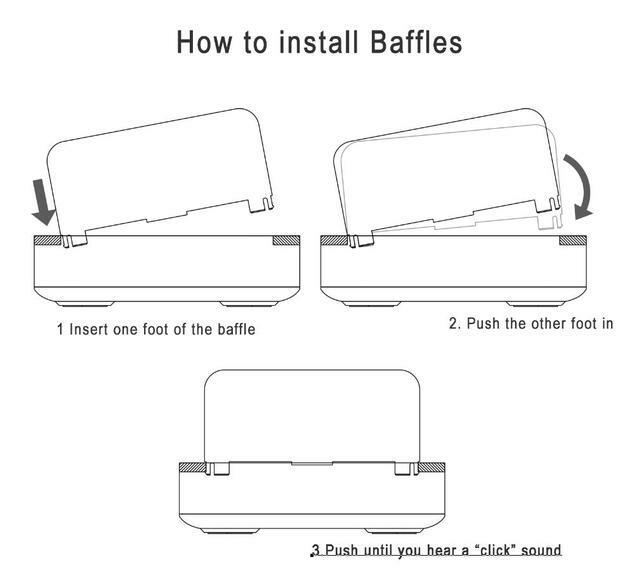 The seller provided instructions the really helped to install the dividers (see image). The charger doesn't come with lightning cables for Apple devices, but I used a cable I already have and it works great. 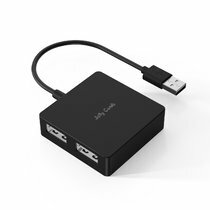 It’s a good product and charges multiple devices fast at the same time. The only thing I dislike about it is how hard it is to put the baffles. If they can make it easier to assemble then it would be a complete 5 stars. Love this. Keeps most of our gadgets charging in just one place without having cords everywhere. This Seenda USB charging station has been a clever solution to keep all my electronics charged in the same location. Prior to buying this, I had bulky Apple chargers plugged into various extension cords and outlets, plus my Android phone charger at a separate outlet, plus my bluetooth headphones in yet another location. This charging station is an excellent solution that brings them all together. The charger comes neatly packaged in a box with each component nicely wrapped for protection. I was able to easily assemble the device by snapping the 5 rack walls into the slots of the charger. 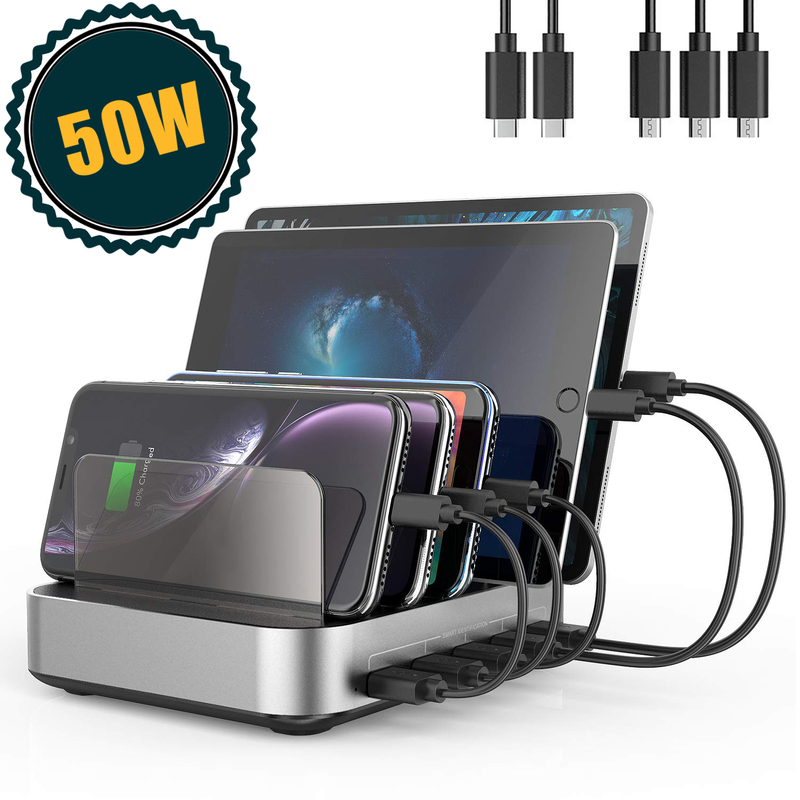 As described in the product description, the charger comes packaged with 5 short cables, the perfect length for plugging into the side of the charger (which houses 5 USB ports) and connecting to my devices nestled in the assembled racks. However - and this is my only quibble with the product - the 5 cables that come with the device are 3 micro USB cables and 2 USB 3.0 cables. All of my Apple devices (a 2013 iPad, a 2015 iPad mini, a 2018 iPad Pro, and a 2018 Apple pencil) are not compatible with either micro USB cables or USB 3.0 cables and instead require lightning cables to charge. I have been able to easily modify the Seenda charger by plugging in my own USB lightning cables into the charging slots and connecting them to my Apple devices - and this charges them rapidly and efficiently just as advertised - but my lightning cables are 6 feet long, and this adds considerable bulk to the device. The other two cables that come with the device - USB 3.0s - are pan-compatible with my current devices, an Android phone and bluetooth headphones, so no modifications needed there. Also, while the space in between the racks is more than sufficient for fitting my Android phone and iPads with thin cases, the space was actually a bit snug for fitting my 2013 iPad with its bulky case, so I simply removed one of the dividers to give it more room, which worked beautifully. Overall I would recommend this charger - it's sturdily built and a good solution for cleaning up outlet and device clutter. I would love it if Seenda gave options to buyers about which set of cables they would want to come with their device - i.e., 3 Lightning cables + 2 USB 3.0, or 3 micro USB + 2 USB 3.0, etc. So I've had this charger for about a week now, and it works really well! The cables it comes with are nice and short, and that makes it easy to keep my desktop clean and tidy. No issues charging multiple devices either. The plastic dividers are a little difficult to insert but you have to put them in at an angle, one side at a time and put a lot of pressure, they're tough so they won't break. This charges my electronics pretty quickly. The ONLY thing I would add would be a lightning charger. I have to use my long one for my iphone because none of the cords are for Apple products. It's easy enough to use your own though.